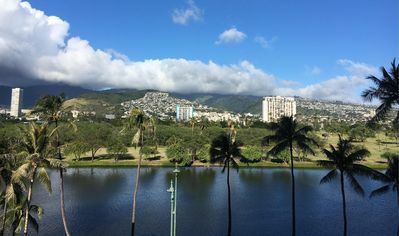 Diamond Head! Available September 17. 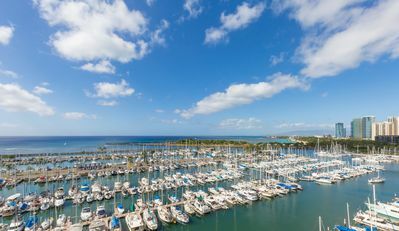 Close to the beach and Waikiki, . Diamond Head Alii. 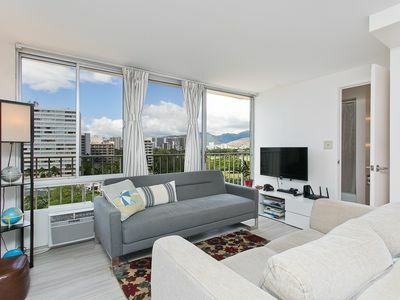 This 1 Bedroom and Lani Apartment is just about two blocks from Waikiki, just below Diamond Head the crater. 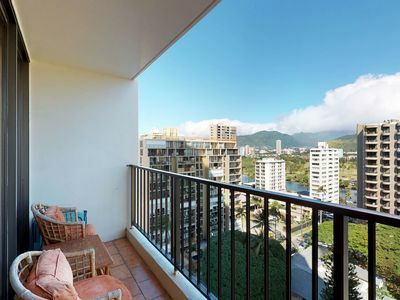 This recently updated 665 square foot condominium is in a very desirable neighborhood, across from Queen Kapiolani Park, near Honolulu Zoo, in the heart of Hawaii. 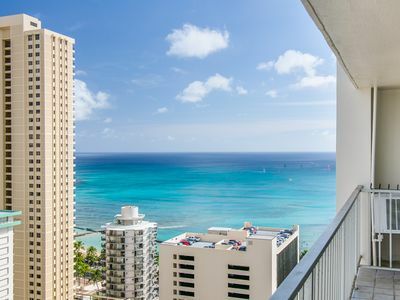 This beautifully modern, top (third) Floor, unit apartment has wonderful views of Diamond Head, tree top view, and stunning Waikiki skyline. All you need for comfort, real hardwood floors, carpet in the bedroom, newly updated kitchen and bathroom. 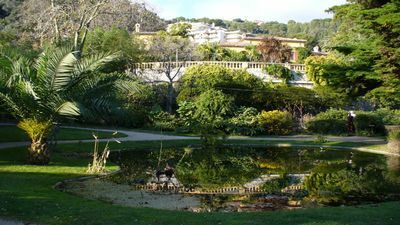 From the Italian porcelain tiled floors and soft, thick Berber carpeting to the antique (and custom made) furniture, appliances, and Roman window shades. 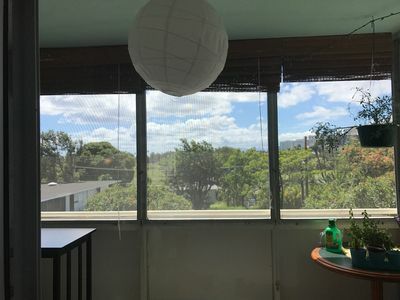 This large, beautiful apartment is an end unit with windows along all three sides, giving it a light, bright and airy atmosphere. 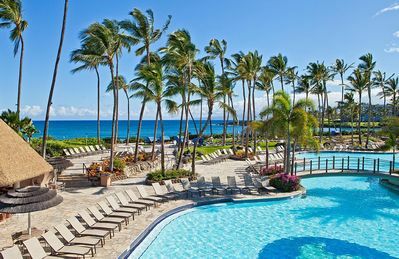 This allows the trade winds to go through and keep it cool and comfortable year-round. If you prefer air-conditioning, we do have a high-powered air conditioner. 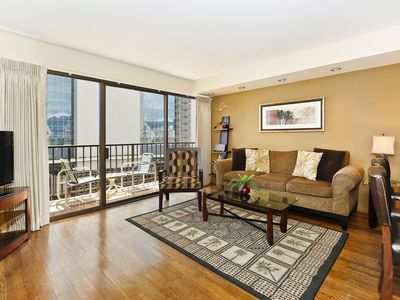 The dining room has beautiful views of the Waikiki skyline, Makiki Mountains and Diamond Head Crater. The dining room table has custom-built, wrought-iron table and seats four people. 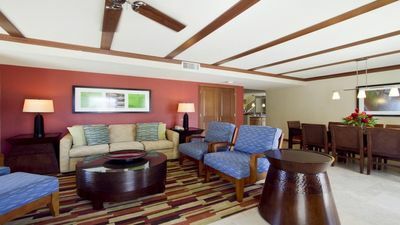 Bring your laptop, as high-speed Internet and Wi-Fi are included and available at all times. 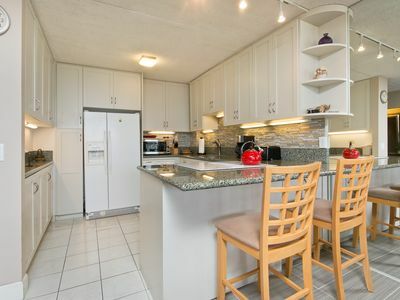 In the renovated, custom kitchen are granite countertops and all appliances including: Stove/oven, refrigerator, dishwasher, garbage disposal, microwave, coffee maker and all small kitchen appliances, including a juicer and a bread-maker. All cookware, knife set, silverware, dishes, table linens, spices and many condiments to save you time and money. 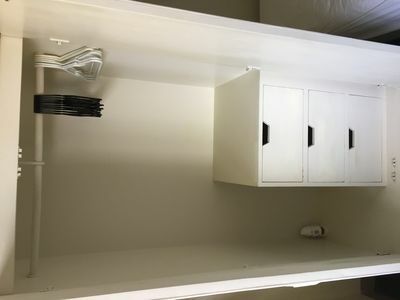 A washer and dryer are located in the unit for your convenience. The living room has an over-stuffed ultra suede couch and attached chaise lounge next to a beautiful antique maple and marble coffee table. The antique armoire houses a large screen TV with cable, a ten speaker Surround-Sound Stereo/CD system and DVD for your viewing pleasure. Fans and lights are remote controlled in the living room and bedroom. The bedroom has a very comfortable, pillow top, queen-size bed with an antique bronze headboard, two beautiful teak and bamboo dressers, mahogany closet doors, crystal lamp, a flat screen TV/DVD player combo, a clock/radio/alarm, a cordless telephone/answering machine, iron and ironing board, all in an elegant Asian decor. Please let us know if you have any special circumstances or needs before your booking so we can accommodate you accordingly. No booking fees and a low cleaning charge. 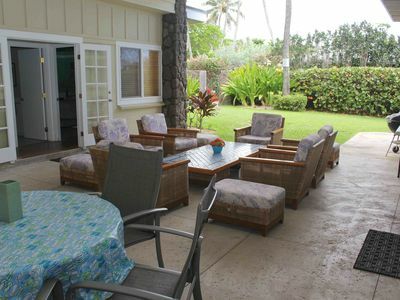 Family Beachfront Estate 3-5 br, 2-4 ba, Sleeps 10-15! 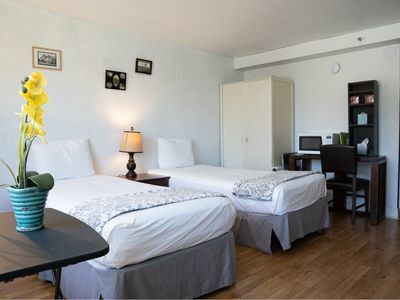 Four Paddle one bedroom with gourmet kitchen, washer/dryer, WiFi and parking! 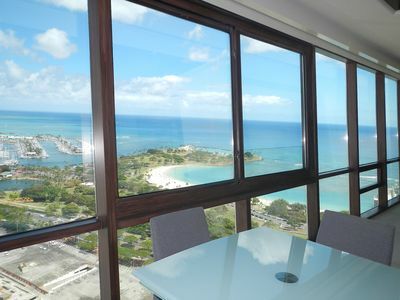 Delightful high floor condo with ocean & mountains preferred view! 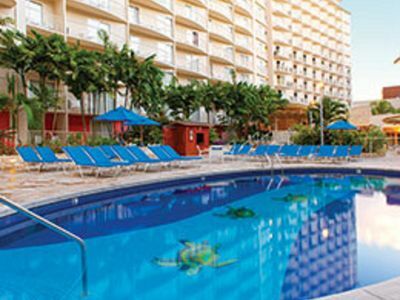 Hilton Hawaiian Village Lagoon Tower, 2 bedroom, Fabulous beach and lagoon! 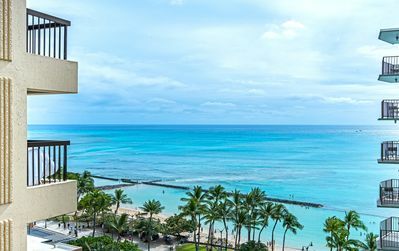 Experience Breathtaking Beauty At Waikiki Beach! 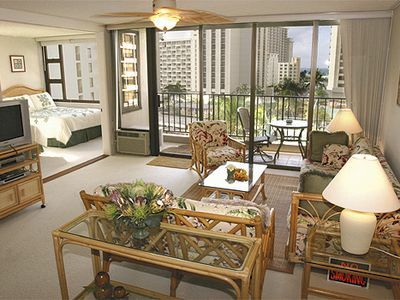 studio in Waikiki with free WiFi! 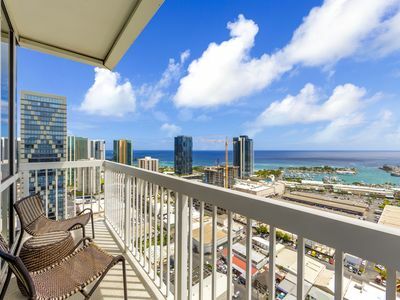 1 Bedroom Diamond Head retreat with stunning ocean views & full kitchen. 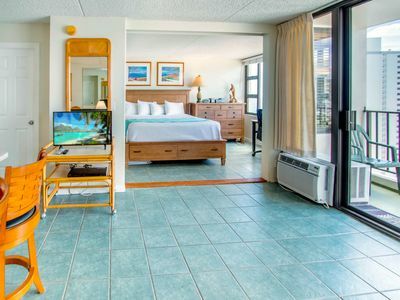 A room fit for royalty at Royal Gardens!